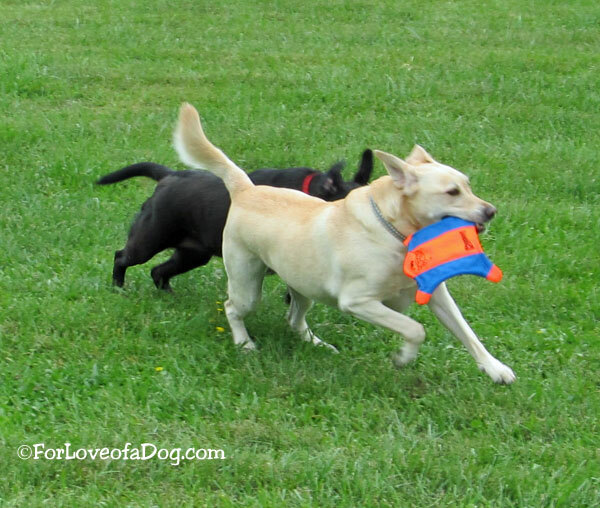 Rosie and Rudy love their Chuckit! Flying Squirrel. Though the dynamic duo frequently engage in tandem retrieving, sometimes Rudy steps on the gas and outruns his little sis. If she can't grab the toy, she might just grab Rudy's collar. Then the poor guy drags her along for the ride. That's funny that she'll grab him by the collar. Run, Rudy! Get ''im, Rosie! A whole lotta fun going on there, great capture.